Sutherland originated on the farm De List and was named after Rev. Henry Sutherland, who annually came to the Roggeveld from Worcester for church services. In 1855 it was decided to establish a congregation here. On 8 November 1858, 30 of 50 plots were sold. 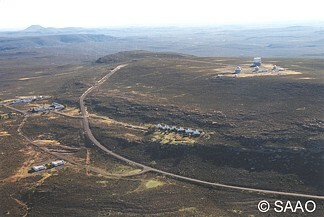 Sutherland is situated at a height of 1450m above sea level on the southwest escarpment of the inland plato. At this height the area is exposed to all the cold air coming from the southwest. Due to the low moisture levels and thin air, heat radiation at night is high. The heavy cold air flows down to the lower valley where Sutherland is situated. 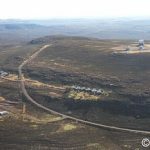 Sutherland is seen to be the coldest place in South Africa. The lowest temperature in 33 years of minus 16.4 oC was experienced on 12 July 2003. Astronomy has the unique capability to spark the imagination of young and old, and provides the Municipality of Karoo Hoogland with exciting opportunities in the development of a unique tourism industry associated with astronomy in and for South Africa. See SALT and SAAO. The growing of tulips in South Africa was pioneered by Rev M B Brink. In 1925 he arrived in Sutherland during a snowstorm. After studying for several years in Holland, he immediately realised the climate in Sutherland was approximately the same as in Holland, therefore ideal for tulip growing. He requested a friend of his to send him seventy five tulip bulbs. He stayed in Sutherland and for a period of twenty five years he distributed one hundred thousand yellow tulip bulbs throughout South Africa.